Redding Center today is much as it was when the town received Parish status in 1729, the center of business affairs. The scenery has certainly changed but the Center is still where all town business takes place in the Town Hall building and at the Old Town House. "The first Society meeting was held June 5th, 1729 (less than a month after the parish was organized). The first three committee men of the parish, elected at this meeting, were John Read, George Hull, and Samuel Sanford. At this time, too, the "places for setting up warnings for Society meetings" were determined on as follows: "In the lane by Ebenezer Hull, and a Chestnut tree by Mr. John Read's, and a post set up by Moses Knapps:" These were the first sign posts in the town." "On August 11, 1783, nine months after the Provisional Articles of Peace had been signed in Paris. "Voted that select men of this town be desired to move out of town: all those persons that have been over and joined the enemy and have returned to town." "In 1878, the Rev. Aaron S. Sanford of New Haven, but of a Redding family, donated $5,000 for the endowment of a high school. This was incorporated as the Hill Academy, and was in operation probably around 1880. The stipulation was that only college graduates could teach there." The Hill Academy continued at the junior high school level for many years, finally becoming a school for all eight grades, when the Center district school was abandoned prior to 1915, it would eventually be converted into the town house. 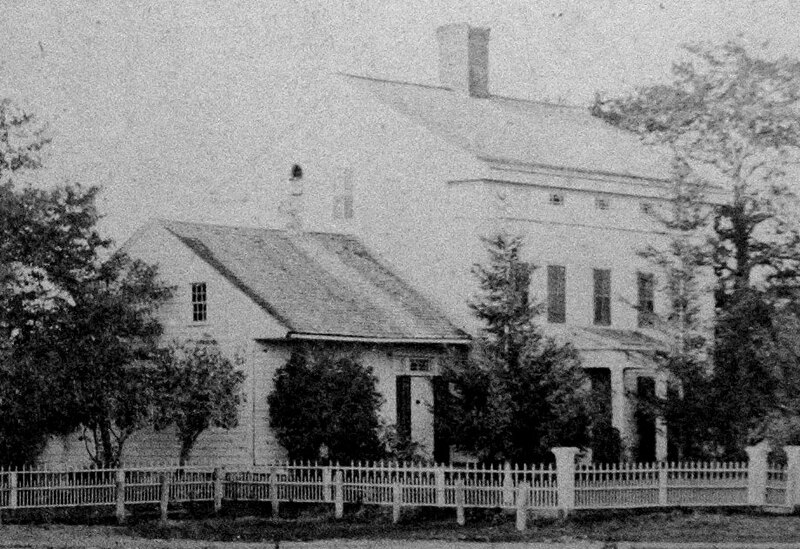 The Hill Academy stood where Town Hall stands today. "Now, therefore, resolved, That the Town appropriate the sum of Four Hundred Thirty-three Thousand Dollars ($433,000.00) for the purpose of constructing , furninshing and equipping an Elementary School Building, as per plans and specifications as submitted and approved by Town Meeting called April 10, 1948, and to authorize the School Building Committee to expend such appropriation." "November 20, 2006: Resolution regarding State of CT Department of Emergency Management Homeland Security; Town of Redding mileage reimbursement rates: discussion of town employees using municipal vehicle compared with using a personal vehicle for conduction of town business. ; CL&P easement: the agreement to trade a parcel of open space for another parcel must be approved at a Town Meeting in lieu of monetary compensation. ; The Commission for the Elderly reported the Commission voted to change the name to the Commission on Aging." 1960, first mention that the building will revert to Congregational society after May 1961, and does...Federated Church becomes 1st Church of Christ Congregational. So if you've ever wondered why there is a burial ground on Great Pasture Rd. or have seen an old postcard that has the Congregational Church at Redding Center labeled as Methodist Church now you know why. Now getting back to the theme of past and present, we'll tackle another topic that has similarities of interest: The Post Office. The Redding Center Post Office is where I spent many afternoons as my Grandfather, Harry L. Colley, was postmaster there for many years. 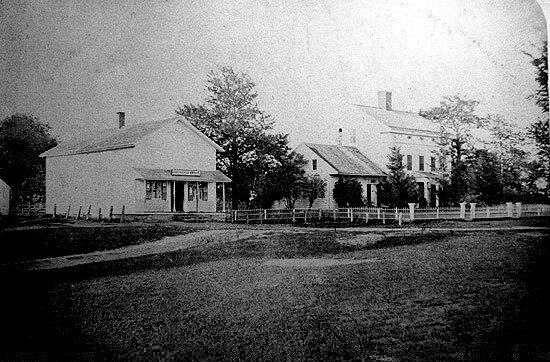 The location of the Center Post Office was not always in that location. "Thomas B. Fanton home and store Redding, Ct.
House that William M. Fanton was born in Feb. 12, 1867"
T.B. Fanton and D.S. Johnson can be found on the Beers 1867 map where Cross Highway intersects with Sanfordtown road. Johnson & Nickerson is what the store's sign says. The store also served as Redding's Post Office for some time. The first Redding Center post office was said to be located at the old Town house. 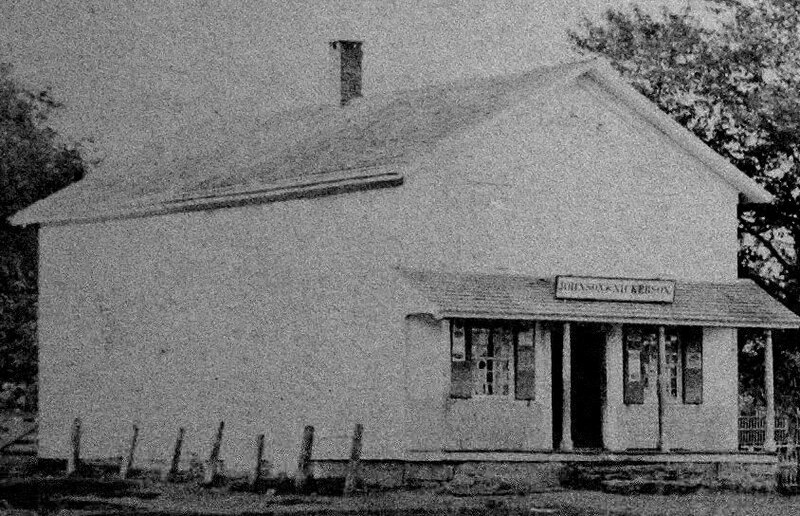 Redding's very first post office was located in the "Boston District" on the corner of Umpawaug Road and Peaceable St., it was established in 1810 by Billy Comstock and later moved to Darling's Tavern across the street in 1823, it was discontinued in 1844. The second post office in Redding was established at Redding Center in May of 1815, under the name "Redding Town House". William Sanford was appointed postmaster at the town center. It appears that the U.S. Post Office Department had planned to change the site of Redding's Post Office from the Boston District to Redding Center in May of 1815. However, because of poor road conditions between the stage coach route and Redding Center (3.5 miles) it was promptly re-decided to retain two offices temporarily...which turned into 28 years, 11 months. * Name of the Redding Post Office was officially changed by the U.S. Postal Service from Reading to Redding on May 30, 1844. An Interview With Stuart Chase "I am a Generalist..."
Beginning at the turn of the 20th Century, in the days of Mark Twain and Charles Ives, Redding became a haven for a number of creative writers and artists in search of a quieter life, away from the pressures of the big city. Stuart Chase was a late comer in that group. A writer of books and articles, he found a remodeled barn, with an apple orchard, a garden, and open fields, which seemed ideal for a writer. When in 1930 he drove up to the village green at the Center, with its over-arching elms and charming white New England church, he promptly returned and bought the remodeled barn. Redding was where he wanted to live, and with his wife Marian, a musician, has lived for almost 50 years. Redding is where most of his ideas have germinated, and where most of his writing has been done. Trips, yes, to lecture around the country (in every state except Mississippi) and visits to London, Paris, Russia, Egypt, Mexico, and the Caribbean. But the real work has been done in the remodeled barn. We asked Mr. Chase if he would summerize his outlook on life, and how it might apply to Redding. He said he considered himslef a philosophic "generalist". A generalist, he said, is an observer who tries to see all the major angles before he comes to a conclusion. He is not a one-party man. He is particularly interested today in the planning of a human community, and the conservation of its natural resources. Redding has an urgent need for both if it is to continue to be a comely rural town in a beautiful natural setting. In one of his columns for the Pilot, the weekly local paper, Mr. Chase wrote an article addressed to children in general and to children of Redding in particular. He wrote: "You have two homes: the house where you live here in Redding, and the planet earth on whose surface you walk, whose air you breathe, whose water you drink, and that provides all your food from its fields, forests and waters. Your house must be kept aired and clean or you may get sick from poisons and infections. "Your planet," he continued, "which is your other home, must also be kept healthy, clean and livable. If this effort fails, we shall all get sick before too long. Presently (1978), on an unhealthy planet, with failing resources, there will be little future for you, and certainly no future for your children. It may take longer for this to happen, but it is as bad to make a mess of your planet as to make a mess of your living room. Indeed, it may be worse; you can get out of your living room in an emergency-say a fire- but you can't get off your planet and hope to survive for long. How many people can a space ship carry? Where can it land and find adequate soil, water and air? "I say I am a generalist," Chase went on to say, "but I have three specialties-economics, communication, and accounting. My father wanted me to follow his footsteps in the accounting profession. I passed my CPA examinations in Boston and practiced for about ten years, part of the time with the Federal Trade Commission in Washington, D.C.
"I discovered that accounting was not my cup of tea, and turned more to writing, especially about economic problems and convervation. My book Rich Land, Poor Land was praised by President Roosevelt, and there was even some talk that he might write an introduction-which did not materialize. I also became greatly interested in how word behave, and have written three books on semantics, a specialty that deals with language and meaning. At the same time I have been concerned with the state of the world in general, and what hard technology is doing to it, and especially what atomic energy may do to us- not only in war, but in peace as well. Where are we going to put the deadly poisonous wastes that are produced in nuclear energy plants? You see, a generalist is concerned with the condition of human life on this planet, above and beyond his particular specialties. We need the physical sciences, like chemistry; the social sciences, like economics; and the human studies, like philosophy and history, to understand our place in the universe. Man became homo sapiens, the thinking creature, when he learned to talk, thousands of years ago. This I believe, may be as important to mankind as the day we first learned to talk. This is a 'cosmic process,' like what goes on in outer space, and in the interior of the sun. A generalist must be aware of these two cosmic episodes in the history of mankind; he hopes that we can deal with them. "On my desk is a motto given to me by my friend Beardsley Ruml when he lived down the road a little way. He was an excellent generalist. The motto reads: 'Reasonable men always agree if they understand what they are talking about.' I wish this motto might be on a number of desks in the Middle East right now in 1978! "Planning and conservation are major interests of a generalist on a world-wide scale. How do they apply to a small community? I have been trying to apply them here in Redding for many years; first as a member of the Zoning Board of Appeals, then as Secretary of the Planning Commission, where I served for 20 years. Open space areas to keep the town rural and green was a major goal of the Planning, Zoning and Conservation Commissions, supported by the Selectmen and by the Board of Finance. When they policy was first introduced in the 1960's there were some 1.3 acres of town owned open space, at the Green. Now there are more than 3,000 acres of all types of Open Space! The policy seems to be working. "I had not been on the Planning Commission long before I discovered the following formula: The more open space we can save, the lower our future taxes will be, and the pleasanter the town. My training as a CPA helped to give the formula a firm foundation. "It works like this: If a parcel of 100 acres is bought by the town for open space, taxpayers of course must pay for it (sometimes with State and Federal Aid), and also pay for any recreation facilities which may be put on it, like tennis courts. Income will be zero. But if the 100 acres are bought by a subdivider, and 30 or 40 houses are built on 2-acres lots, the cost to taxpayers in providing roads, fire, police and other services, and especially education in the public schools for the new children, usually comes to a much greater cost. As a CPA, I have verified this in case after case. Often the cost to taxpayers of a subdivision development on 100 acreas, is twice the cost of buying the land as open space. The cost to taxpayers is thus not a burden but the reverse-when compared to all the costs of a new subdivision. "The physical topography of Redding is another cogent reason for holding open space rather than developing subdivisions. The town has three steep hills- Little Boston, The Center, The Ridge- which prevent the construction of economic water and sewage pipe lines. We must live on individual driven wells and septic tanks. Also our preponderance of clay soils makes even septic tanks a special problem (ask David Thompson of the U.S. Soil Conservation Service). "Another sound reason for holding opening space is that Connecticut is the second worst state in the Union suffering from air pollution. My glass rain gauge supports this government report by turning black at the bottom in about two months of operation! The pollution comes from industrial operations in NY and NJ, the expects say. the Tri-State Commission has nominated Redding a kind of fresh air haven. If it can be kept open all of Western Connecticut will benefit. "The Saugatuck Reservoir, which is partly in Redding, not only provides some town open space in the form of water, but more important, demands a lot of undeveloped land. Its watersheds must be kept clear and underdeveloped if pure water is to be supplied to Bridgeport, Westport and other towns. Just to keep the record straight I must admit that I opposed the building of the Saugatuck Reservoir because of its elimination of some good farmland. This was before we had developed the open space formula. A generalist lives and learns like everybody else. "The Planning Commission for these and other reasons is aiming at a quarter of the town of Redding, some 5,000 acres, to be held forever open. So in Redding we have in full display two of the major goals of a philosophic generalist-careful planning, and the conservation of natural resources. It has been a great privilege for me to to work with my fellow citizens on these goals over the years here in this beautiful, unspoiled New England town...May it never become 'Levittown-on-the-Saugatuck!'" John Read bought a tract of land in 1711 from the Indian, Chicken Warrups. This tract now makes up the 300 acre farm of Betty & Sam Hill. Thus the farm was christened Warrups Farm (across from Redding Country Club). On Warrups Farm stands a lovely white house. The house has quite a history . John Lee Hill, the 5th child of Colonel John Read,* built the house in 1841, a year after his marriage to Harriet Duncomb. Their child, William Hill, married Althea Hotchkiss and had four children. Among them was Ernest Hill, the father of Sam Hill. The house remained in the Hill family until 1907. For the next 22 years, there was a succession of owners. In 1929, Ernest Hill purchased the house and the homestead was back in the family. Today, Samuel Ervin Hill, the son of Ernest and his wife Betty, own the house now. They restored the home to its former beauty in the late fifties. In recent years some overgrown fields have been cleared for farm and pastureland. With their son, William, acting as farm manager, the Hills raise Scottish Highland Cattle, hay, cut flowers and produce. They also make maple syrup in the spring. It is hoped the Hill Homestead can be passed on from generation to generation and will always be part of the hertitage of Redding. *Colonel John Read was the grandson of John Read for whom the town was named. Check back for updates. 06/04/07 BMC.